Sometimes I forget how easy things are here in the city. I complain about having to drive OTP to get real Chinese food or having to fill up the tank more than once a month, quickly forgetting how different things were when I lived in Florida. But we have so many great things available to us that make living here grand (and yes, I should blog about those more). For instance, Farm Mobile. Farm Mobile is a mobile farmers market on wheels brought to us by local organic farmers Riverview Farms. Inside, shelves are stocked with organic locally- grown produce, free-range eggs, breads from H&F Bread Co., and sustainable meats. They stop at various neighborhoods around town, alerting people via Facebook or Twitter to their schedule updates, and one of their stops is right in our neighborhood. Could shopping locally-grown get any easier? 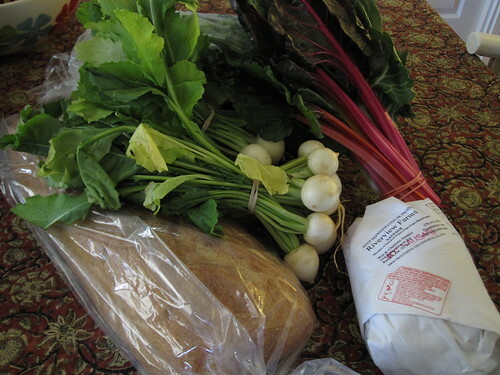 Our haul – H&F bread, hakurei turnips, swiss chard, braising greens, and Riverview Farms hot italian sausage – yum! that is so awesome! I was looking on the internetz today to find a good butcher in Greenville for when we move back and I’m having no joy. I am envious of your little Farm Mobile! You are currently reading Farm Mobile at mingaling.